Vancouver is in desperate need of new solutions to ease its worsening housing affordability crisis. The 8th annual Demographia housing affordability survey released by the Frontier Centre found that Vancouver has the second least affordable housing market next to Hong Kong. On average, and assuming zero interest, a house in Vancouver would cost the median family more than ten years income. Three years is the threshold after which a market is considered unaffordable. Mayor Robertson recently announced the launch of a new task force to tackle the housing affordability crisis. The only way to tackle this problem is to focus on getting more housing units on to the market. Much of the debate around housing affordability descends into discussions about manipulating housing prices by freezing out market mechanisms. Rent control used to be a popular remedy, until cities realized that the side effects of the cure were worse than the disease. Two common methods of attempting to tackle housing today are social housing and inclusionary zoning. Social housing has been responsible for creating some of the most crime ridden neighbourhoods in the Western world. There is a reason "the projects" have such a bad name. Yet politicians of all stripes tend to promise more "affordable housing" as they call it, knowing that it will at best benefit a narrow group of people who qualify. Inclusionary zoning—requiring developers to build a specific number of below market rate units in new developments—has been one of the methods that municipal governments have attempted to compensate for this shortcoming. It also misses the point. It fails to bring broad price levels down, since it increases prices substantially for market rate units in the same development. One study from San Jose State University economists found that inclusionary zoning increases the price of market of new homes by $22,000-$44,000 in the median city. That is simply how developers pass off the cost of losing money on affordable units. The policies mentioned above ignore the fundamental issue: houses are priced by supply and demand. In a desirable city like Vancouver, prices are bound to be higher than in Omaha, Nebraska, or Saskatoon. But the dramatic price escalation that started in the 90s isn't beyond the city's control. There are many ways to get more supply on the market. One of the commendable policies undertaken by the city has been the introduction of laneway houses. These are small units that are hived off from existing houses. They are essentially small secondary suites that back in to laneways. But it won't be anywhere near enough on its own. Vancouver needs to develop more land. The land is there, but it is off limits to development because of the agricultural land reserve (ALR). That needs to change. The ALR serves two purposes. The first is to preserve agricultural land. The benefit from it is contingent on whether the benefits from local agriculture outweigh the costs of taking land off of the market. From a nutritional and an economic perspective that simply isn't the case. Flash frozen foods are often more nutritious than "fresh" local food, and intensive farming is more economical and sustainable than small scale farming. We would not be able to accommodate anywhere near our current population without industrial agriculture. This justification simply fails. The second justification for the ALR is to prevent urban sprawl. In a sense this works, since there is no sprawl development in the ALR. On the other hand, this approach is conducive to "leap frog" development which takes place beyond the growth boundary. It happens anywhere that a growth boundary exists. People commute further for cheaper housing. This is as true in the smart growth Mecca of Portland as it is in Toronto or Ottawa. From an economic perspective, there are reasons to worry about sprawl. People who move out into cheaper housing on the urban fringe typically pay less property taxes, and often cost municipalities more per capita. But the ALR hasn't solved this problem. 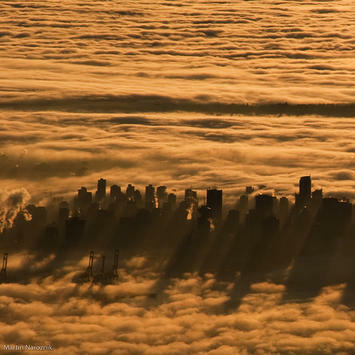 Metro Vancouver outside of the city proper accounted for 87% of the metropolitan area's growth between 2006-2001. Simply put, the ALR simply hasn't prevented sprawl. In order to balance the concerns of housing affordability and urban sprawl, the city of Vancouver should strike a compromise: open portions of the ALR, but only to high density development. This may not be the optimum solution for families that would prefer to purchase single dwelling homes, but a significant influx of new units would be a countervailing force against runaway home prices. This would also put downwards pressure on housing in the rest of Greater Vancouver. Though opening up broad swaths of the ALR may be the ideal, this seems like a reasonable compromise. This type of solution would rile people on both sides of the political spectrum, but it would be a dramatic improvement over the status quo. High home prices can only be solved from the supply side. The choice between maintaining the ALR as constituted or opening up portions should be obvious. Infill development can only go so far towards solving Vancouver's housing crisis. website yesterday and it has some nice offers for people who want to change something in their house. Submitted by Todd Litman on Mon, 03/12/2012 - 09:47. Thanks for this column, Steve. However, I think it overlooks two important factors. First, true affordability must account for housing and transportation costs together. An inexpensive home is not truly affordable if, because it is in an isolated, automobile-dependent location, it has high transportation costs. The Center for Neighborhood Technology's Housing + Transportation Affordability Index (http://htaindex.cnt.org), which indicates the combined housing and transport costs for many U.S. cities based on actual household expenditure data, shows that the most truly affordable housing is generally in the more central, multi-modal locations. This is the type of housing supply that must be increased if you want true affordability. Second, of the constraints on housing affordability, restrictions on infill development tend to be more significant than restrictions on urban expansion. For example, analysis by Edward L. Glaeser and Joseph Gyourko ("The Impact of Zoning on Housing Affordability," Harvard University, 2002, at www.law.yale.edu/documents/pdf/hier1948.pdf ) indicates that constraints on parcel subdivision (a developer's ability to subdivide a parcel, so for example, a half-acre lot can be divided into five tenth-acre parcels, or converted from single-family to multi-family) explains housing unaffordability in regions that have high housing demand, such as Vancouver. Similarly, my own research ("Parking Requirement Impacts on Housing Affordability" at www.vtpi.org/park-hou.pdf ) and research by Wenya Jia and Martin Wachs ("Parking Requirements and Housing Affordability; A Case Study of San Francisco," Research Paper 380, University of California Transportation Center, 1998) indicate that generous minimum parking requirements significantly reduce housing affordability. The ALR limits urban expansion, which tends to increase unit land costs (dollars per hectare), which will increase housing costs unless development policies are reformed to allow more compact development (more housing units per hectare). This is an essential component smart growth policy. Fortunately, the city of Vancouver and the Greater Vancouver Regional District recognize this and are supporting Ecodensity policies that support more infill development. There is plenty of potential. For example, even along Broadway, one of the City's main arterials, many buildings are only one or two stories high; there is plenty of potential for converting them to mid-rise housing-over-commercial. This responds to the growing demand for compact, low- and medium-priced housing in accessible locations. This is not to say that all housing development should be multi-family within the City of Vancouver. These same concepts can be applied to suburban locations by creating mixed-use, walkable and transit-oriented urban villages that include a combination of single- and multi-family housing. CTOD and CNT (2006), The Affordability Index: A New Tool for Measuring the True Affordability of a Housing Choice, Center for Transit-Oriented Development and the Center for Neighborhood Technology, Brookings Institute (www.brookings.edu); at www.brookings.edu/metro/umi/20060127_affindex.pdf. FTA (2008), Better Coordination of Transportation and Housing Programs to Promote Affordable Housing Near Transit, Federal Transit Administration, USDOT and Department of Housing and Urban Development; at www.huduser.org/Publications/pdf/better_coordination.pdf. Todd Litman (2009), Transportation Affordability: Evaluation and Improvement Strategies, VTPI (www.vtpi.org); at www.vtpi.org/affordability.pdf. Todd Litman (2009), Where We Want To Be: Home Location Preferences And Their Implications For Smart Growth, Victoria Transport Policy Institute (www.vtpi.org); at www.vtpi.org/sgcp.pdf. Todd Litman (2010), Affordable-Accessible Housing In A Dynamic City: Why and How To Support Development of More Affordable Housing In Accessible Locations, Victoria Transport Policy Institute (www.vtpi.org); at www.vtpi.org/aff_acc_hou.pdf. Todd Litman (2012), Debating Smart Growth, Planetizen (http://www.planetizen.com/node/54830 ). Simon McDonnell, Josiah Madar and Vicki Been (2011), “Minimum Parking Requirements And Housing Affordability in New York City,” Housing Policy Debate, Vol. 21, No. 1, January, pp. 45 – 68 (www.informaworld.com/smpp/content~content=a931285978~frm=abslink); based on A Continuing Role for Minimum Parking Requirements in a Dense Growing City?, Furman Center for Real Estate and Urban Policy; at http://lsr.nellco.org/cgi/viewcontent.cgi?article=1218&context=nyu_lewp. Vancouver EcoDensity (www.vancouver-ecodensity.ca) is an integrated program to increase urban livability, affordability and environmental performance throught policy and planning reforms that encourage more compact, mixed, infill development. Submitted by John Niles on Fri, 03/09/2012 - 13:54. Zoom in to see what I mean. The subdivisions crawling up the hillsides against the panorama of mountains are as striking to me as the glass high rise towers in the Vancouver downtown. Anyway, some of my best friends are residents of that region. The ones who already have houses seem to like the Agricultural Land Reserve and the local produce that results -- "Grown in BC." But many also have children who hope to buy houses some day, so the compromise proposed above -- partial opening of the ALR to high-density housing -- strikes me as workable, politically, to balance conflicting attitudes.